Mitchell Hughes is a South Carolina native and USC graduate. He began practicing in 2002 at Gaea Yoga in Mt. Pleasant, where he later received his Yoga Teacher Certification in 2004. Mitchell taught at several studios in Charleston before traveling the country for a year and practicing with various yoga practitioners from California to New York. Given the versatility of the yoga principals, Mitchell returned to Columbia determined to share what he was learning with those less likely to have experienced yoga. Grass Roots Yoga was born from teaching in a friend’s home to a small group of neighbors, until outgrowing the space and moving into the Calendar Court studios. The intention behind Grass Roots Yoga is to provide a space where anyone has the opportunity to discover his/her own ability to heal and transform. 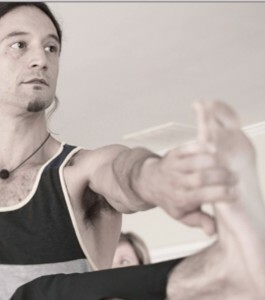 With a background in music and literature, Mitchell brings a unique and dynamic approach to teaching yoga. His colorful descriptions and refined yet playful guidance of the body creatively illustrate the interconnectedness of movement and breath. Growing up playing sports and practicing Karate, he has a natural ability in translating movement with athletes and those impacted by injuries and chronic pain. Since 2011, Mitchell has been honored to provide yoga instruction to the USC Gamecock Equestrian Team—3 time SEC Champions (2011 – 2014) and National Champions (2015). Mitchell partners with Hall of Fame Martial Artist Mike Genova and Genova Family Karate to bring yoga to karate students of all ages. Ken Taylor, a former NPC multi-titled bodybuilding champion, has teamed up with Mitchell to incorporate yoga into his own unique versions of personal fitness and golf training. Likewise, Mr. Taylor’s fitness training has been beneficial to diversify Mitchell’s yoga practice. Athletes, including some suffering from severe, career-ending injuries, have turned to Mitchell’s yoga teaching to build freedom of movement and agility. Clients in chronic pain—from rheumatoid arthritis and bulging spinal discs to sciatica and piriformis syndrome—have discovered ongoing relief and recovery with Mitchell’s one-on-one instruction. The principles that guide Grass Roots Yoga include the power of the mind and the engine of breath behind it. It is through breath and movement that students grow into stillness and their true potential. Grass Roots Yoga is a place to explore your greatness and capacity to be spectacular. Mitchell is deeply devoted to the yoga practice and teaches with the belief that we all hold the ability to heal and empower ourselves. He teaches the same way he appreciates to be taught – with love, kindness, patience, thoroughness, optimism, humor and the encouragement to trust in one’s self and one’s breath. Grass Roots Yoga is you—the individual—growing, transforming and blossoming.